MENOMONEE FALLS, Wisc., Feb. 20, 2019 /PRNewswire/ -- In the midst of this year's flu season, Americans are taking preventative measures into their own hands. Three out of four say they step up their hand hygiene in response to virus outbreaks. Specifically, they wash more frequently, more thoroughly or longer, according to a national survey conducted by Bradley Corporation. That's good news because the Centers for Disease Control (CDC) says hand washing is the easiest and most effective defense against illness. The survey also found that half of adults make a conscious effort to drink more fluids to reduce their likelihood of catching a cold or the flu. A good number rely on vitamin C or a zinc supplement as a preventative measure while others avoid touching their face, mouth and nose. Unfortunately, in today's 24/7 environment, just one out of three get more sleep to try and fend off illness. The findings are part of the 10th annual Healthy Hand Washing Survey that queried 1,264 adults throughout the United StatesJan. 3-8, 2019. When Americans are feeling ill, nearly two out of three use over-the-counter medicine as their go-to remedy. A second group visits the doctor and a small number call their mom or conduct a virtual or online doctor visit. Approximately one out of five say they actually prefer to ignore their illness and hope it goes away. It may not be a surprise but men were significantly more likely to ignore their illness than women. The survey revealed that sick Americans are considerate. More than half stay home to avoid passing their germs onto others. They also wash their hands more frequently, use antibacterial soap whenever possible, sneeze into the crook of their elbow and avoid shaking hands. 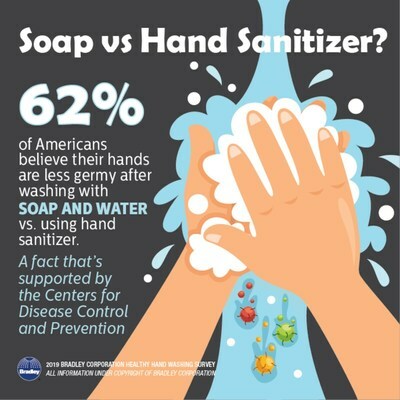 In terms of a preferred hand cleaning method, nearly two out of three Americans believe their hands are less germy after washing with soap and water than after using hand sanitizer – a fact the CDC supports unequivocally. According to the CDC, while hand sanitizer can be beneficial, washing with soap and water is the best way to reduce the number of germs. And, the CDC says it's important to know that hand sanitizers are not effective when hands are visibly dirty. "The proper way to wash is to use clean water and soap. Rub your hands together and scrub front, back and in between your fingers for at least 20 seconds. Finally, rinse and dry," says medical microbiologist Michael P. McCann, Ph.D., professor of biology, Saint Joseph's University. "Thorough hand washing with a scrubbing motion is highly effective in removing bacteria, viruses and other disease-causing microorganisms from the surface of the skin." 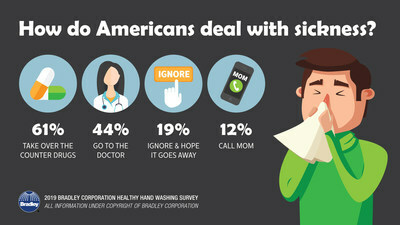 Bradley Corp. fielded its first Healthy Hand Washing Survey in July 2009 at a time when the H1N1 virus was a national concern. Back then, just 45% of Americans said they elevated their hand hygiene in response to virus outbreaks. Today, that number has jumped to 73% who do a better job of washing up when there's a significant virus going around. A statistic that has remained relatively unchanged over the years is the fact that, then and now, Americans report washing their hands 87% of the time after using a public restroom. For the instances when they didn't wash, the reasons cited include sinks that weren't working or were unclean or a lack of soap or paper towels. Another interesting finding is the fact that women outperform men in hand hygiene. The survey has consistently revealed that men are more likely to skip the soap and simply rinse their hands after using a public restroom. In addition, men frequently report seeing others leave the restroom without washing their hands. Surprisingly, it's men who seem to respond to posted hand washing reminders more than women. In 2017 when the question was first posed, 44% of men said they were more likely to wash their hands after seeing a sign that requires employees to wash before returning to work compared to 34% of women. "For the past ten years, Americans have demonstrated they believe washing their hands after using a public restroom is very important," says Jon Dommisse, director of strategy and corporate development for Bradley Corp. "However, their actual hand washing follow-through appears to fluctuate depending on the prevalence and severity of flu outbreaks. Our intention for conducting this survey is to elevate awareness of the effectiveness of washing with soap and water, and help make diligent hand washing a health necessity year-round." Bradley Corp. is a leading manufacturer of commercial plumbing fixtures, washroom accessories, restroom partitions, emergency fixtures and solid plastic lockers. The 10th annual survey queried 1,264 American adults online Jan. 3-9, 2019, about their hand washing habits in public restrooms and concerns about germs, colds and the flu. Participants were from around the country, were 18 years and older, and were fairly evenly split between men and women (49 and 51 percent). For more information, visit www.bradleycorp.com/handwashing. For over 95 years, Bradley has created the most complete and advanced commercial washrooms and comprehensive solutions that make industrial environments safe. Bradley is the industry's leading source for multi-function hand washing and drying fixtures, accessories, partitions, solid plastic lockers, as well as emergency safety fixtures and electric tankless heaters for industrial applications. Headquartered in Menomonee Falls, Wis., USA, Bradley serves commercial, institutional and industrial building markets worldwide. For more information visit https://www.bradleycorp.com.